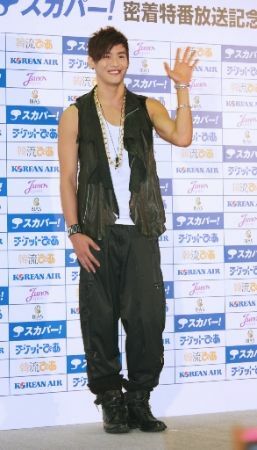 On the 18th, Tohoshinki’s Junsu (23) appeared as a guest at his twin brother Zuno’s showcase live at the Tokyo JCB Hall. In his first public stage since the NHK Kouhaku Uta Gassen at the end of last year, he sent a message to the fans, “The time has come for us to meet soon, so please wait a little longer.” As the suspension of their activities was announced on the 3rd, this is the first time information about their activities was mentioned by any of the members. On the 14th, Junsu formed a new unit with Jejung and Yoochun. In June, they will hold Lives at Kyocera Dome, Osaka, and at the Tokyo Dome. This entry was posted in DTL News Preview and tagged Avex, Jaechunsu, junsu. Bookmark the permalink.